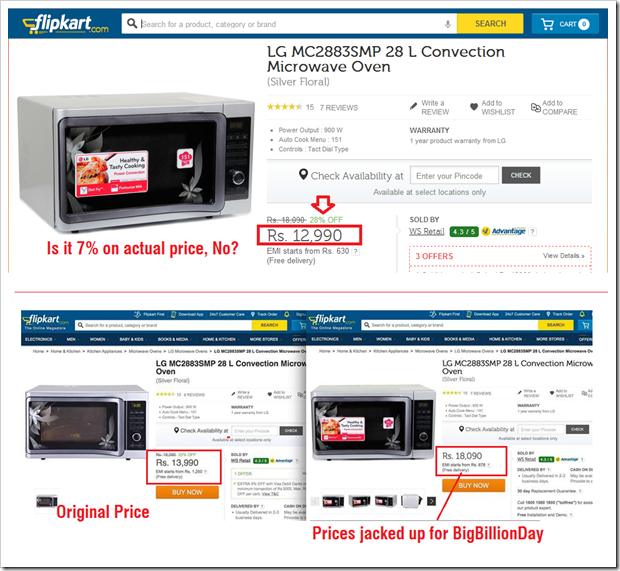 Flipkart had not left any stone unturned while advertising their ‘The Big Billion Day Sale’ on October 6th. Full page advertisements on leading newspapers, radio ads, TV ads, SMS ads and digital ads all over the web. I doubt any Internet user in India was not aware of this mega sale by India’s leading ecommerce portal. But at the end, it proved to be a huge disappointment for those who ventured out into their portal yesterday. Not one but hundreds and thousands of social media users have vented out their anger and frustration on the inefficiency of the sale. As per the announcements, the ‘Big Billion Day’ sale was conducted so that one billion Indians can converge on Flipkart on one particular day, and shop their hearts out. October 6th was chosen as the founders of Flipkart had launched their venture from the flat number 610. But besides perfect marketing and advertising of their intentions, unfortunately very less was done to make the shopping experience smooth, and servers robust to handle the onslaught of traffic. As per the advertised information, Flipkart was supposed to provide heavy discounts ranging from 10% to 50% on electronics items, books, mobiles and other products. As soon as the sale period started on Monday morning, consumers who logged into their Flipkart accounts witnessed server crashes and incomplete orders. The products which the consumers clicked suddenly became ‘Out of Stock’ or the page failed to open. And some of the fortunate few who were able to put across the order, failed to make payments. And even if the payment was done at the discounted rate, the consumers soon received emails stating that the order was cancelled due to ‘technical issues’. In case the consumer was brave enough to order it second time, to his horror, the price was found to be even higher than other ecommerce portals selling the same item. 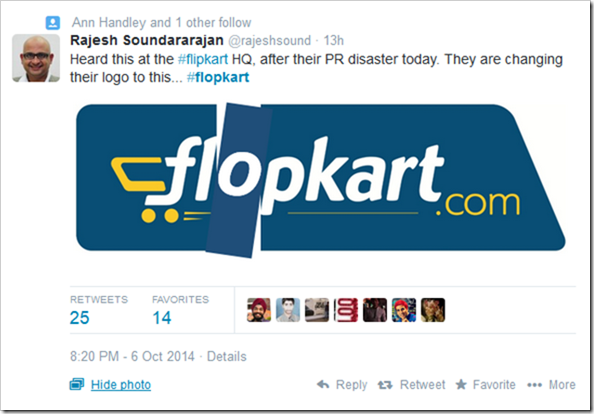 It was a big goof-up on the part of Flipkart, and the Tweets and comments clearly share the sentiments. The Twitterati were at it for the whole day – no wonder the #BigBillionDay hashtag was top trending for 11 hours and 15 minutes on 6th October. A Twitter user actually shared images of the price fluctuation, which several consumers described as ‘price rigging’. They claimed that the price was intentionally increased just before the sale so that they can show the discount. Frustrated consumers created special hashtags on Twitter to vent out their anger. Some of the hashtags were: #FlopKart; #BigBillionFoolsDay and more. Were you successful in purchasing any product from Flipkart during their ‘Big Billion Day Sale’? How was your experience? Please share your feedback and suggestions by commenting right here! first I have placed an order in the at 12 PM r but after certain level the web site look like hanged or crashed. it was not moving further. Again I have tried second time at 1 P.M and made payment through credit card. then order placed and Payment also processed and recd the message from Citibank and Flipkart. unfortunately after some time time i found that I have recd 2 messages on different order numbers. my earlier order was also processed. through COD. actually i want to pay through Citi Bank to get 10% discount. now at last what happened. my money transferred from my card will refund after one week and I have to wait for COD for my MOTO G(2nd Gen) and the 10% Citibank cash back facility wont get to me. Sir,you are right that Flipkart didn’t live upto the mark and was rigging the prices,no where were jbl speakers given for Re 1,and many other items which were shown in advertisements were not having the same price as was shown.And I think Flipkart did it intentionally because from the starting Flipkart strategy is to stay in the news ,whether the publicity is good or bad. Thank you for writing such a wonderful article. You are very right they were selling tab @5190 one week ago yesterday they sold same tab @5900 after discount. Another tab which was available @5900/- sold at @7900 unbelievable. They can say it was success but for customers it was a big game. @ Ankur yes Moto phone were rightly priced. Went to flipkart. Saw the item. Purchased it in Amazon for the exact same price. Sale, my foot! Might have been a failure for few, but overall i think from a brand perspective it achieved what it set out to.. they drove adrenaline across buyers, you made purchases for discounts whether you needed it or no, besides offering a bait for offline user to get online… lots achieved, could have been a failure on few fronts but overall victory if you were to ask me. PS: I personally bought 2 Moto G phones for my friends and saved 4k on each phone, that too without any technical glitches.